Fluid pressure control is used to control and regulate the difference of pressure applied by liquids, gases and plasmas in hydraulic systems between two levels. Pressure control systems are found in almost every hydraulic system, and they assist in a variety of functions, from keeping system pressures safely below a desired limit to maintaining a set pressure in (part of) a circuit. Poor pressure control can cause major quality, safety and productivity problems. Pressure measurement of fluids is the measuring of a force per unit area applied by liquids, gates and plasmas. Pressure measurement of fluids can be either static (no motion) or dynamic (in motion). 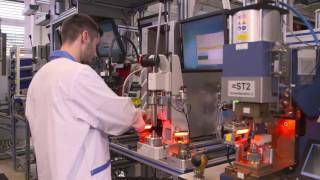 This Technology Zone offers an insight into the latest innovations in pressure control and measurement of fluids. Integrative pressure measurement in the smallest of spaces: WIKA has expanded its portfolio for OEM applications with the very compact MPR-1 piezo sensor module with standardised output signal. With their new P-800 series, Bronkhorst introduces a product line extension of the EL-PRESS / IN-PRESS product portfolio. BEREA, OH – NOSHOK’s new generation 402/502 Series Extreme High Pressure Gauges are in compliance with the new DIN 16001 standard, which specifically addresses extreme high pressure ranges starting at 30,000 psi. WIKA has expanded its range of portable calibrators to include an instrument with integrated electric pressure pump. Besides, the new model CPH7650 pressure calibrator – designed within a robust case – is multi-functional: It also fulfils test tasks for the measurement parameters of voltage and current. KLINGENBERG – WIKA has expanded the application possibilities of its hygienic diaphragm pressure gauges of the PG43SA series: The model PG43SA-S is now also available in a version with ATEX approval. The pressure gauge can thus be used in hazardous areas for ignition protection type Ex h zone 1 (gas) and zone 21 (dust). BEREA, OH – NOSHOK is pleased to announce our re-engineered and expanded Piston Type and Diaphragm Type Differential Gauges. PENNSAUKEN, NJ, NewTek Sensor Solutions offers standard and custom LVDT Position Sensors that operate with excellent reliability and infinite resolution in the high-pressure and high-temperature environments of downhole drilling applications.